Cody Willoughby | AIM Media Midwest Jose Adorno and Alex Grabeman, of Piqua, enjoy the swings on Monday at Fountain Park. For the first time in 2019, average daytime temperatures throughout the county are forecasted to remain above 45 degrees for the next seven days. 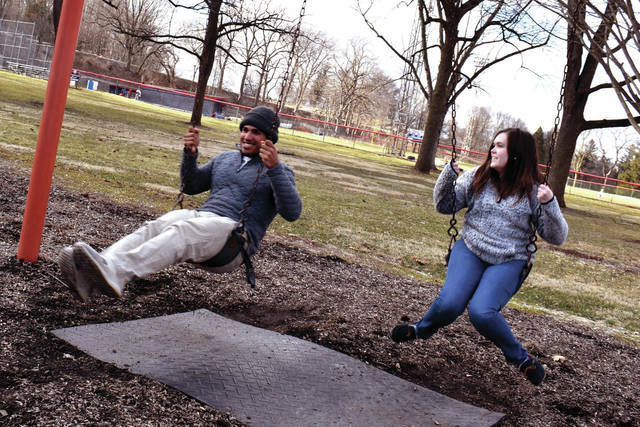 Jose Adorno and Alex Grabeman, of Piqua, enjoy the swings on Monday at Fountain Park. For the first time in 2019, average daytime temperatures throughout the county are forecasted to remain above 45 degrees for the next seven days. https://www.dailycall.com/wp-content/uploads/sites/30/2019/03/web1_Spring1.jpgCody Willoughby | AIM Media Midwest Jose Adorno and Alex Grabeman, of Piqua, enjoy the swings on Monday at Fountain Park. For the first time in 2019, average daytime temperatures throughout the county are forecasted to remain above 45 degrees for the next seven days.